One of our trained technicians known as Advisors will visit your home to confirm the design is accurate, make any necessary tweaks, inspect your roof and electrical panel to ensure they’re good for solar and answer any of your questions in person. After that’s done, then it’s time to go solar. 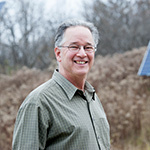 Tim Roper joined SunCommon with a wealth of solar sales experience and success in the industry having started his solar career in 2007 with groSolar in eastern Massachusetts. His success at groSolar opened the opportunity for moving up to manage their five state, northeast sales region from 2009 through the first quarter of 2011 when the company sold their residential solar division to industry giant, SolarCity. When asked why he wanted to join the team at SunCommon he’ll tell you that it was the company’s leadership, mission, customer friendly business practices and long term vision that attracted him here.